Do you know what Saleslider is? 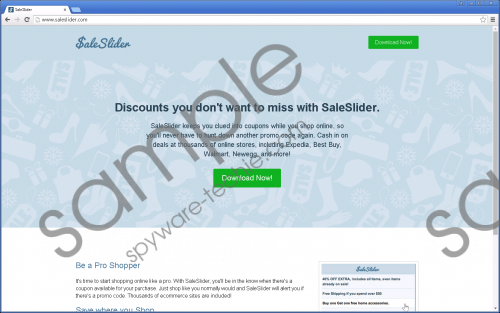 Saleslider is another adware application that targets online shoppers. Do you feel that you pay too much for the goods you buy from online merchants? Then you may think this program is useful, as it says that you will see coupons with the best available promo codes on the popular e-commerce websites, such as Best Buy or Walmart. But the cons of adware programs usually outweigh their pros and Saleslider is no exception. Removal of this program is the decision that we think you should make. You may ask what is wrong with those ads. Maybe you will even encounter a very relevant offer or find that those ads promote the things you are interested in. But this could happen not by accident. Saleslider uses various data tracking technologies in order to find as much as it can about you. All the collected information is used to deliver you tailored ads thus increasing the possibility that you would click on them. But be cautious and do not do it. The reason is that Saleslider cooperates with unknown third parties and even grants them access to all the gathered information about you. Thus, if the people standing behind those third parties have something illegal in mind, they would use Saleslider ads for their goals. Clicking on the ads may redirect you to suspicious and even malicious websites created only for scamming purposes. You will never know which advertisement is safe to click and which is not, so it is better to remove the adware program and not encounter any ads at all. While testing this application, we have found striking similarities to the Harvest Savings and Web Security app adware applications. We can even state that Saleslider is an exact duplicate of the abovementioned programs. All of them are mostly coming to users’ computers unnoticed. They are not distributed via some official source but are placed in packages with other applications. Do you remember downloading some program from websites offering free software? Have you attentively read the Terms of Conditions of that program during its installation? The answer is probably No, and, most likely, you have received Saleslider in a bundle with that program. You should know that the same bundle might have contained more dangerous applications, so you should get rid of the bad habit of rushing through the installation wizards. The program can be easily eliminated even by average computer users. Our guide explains how to remove Saleslider both from your program list and from browser extensions. But do not think that your problems are already solved as other infections could already be damaging your device. The best decision you can make is to scan your computer with a reliable antimalware program. If some threats are found, purchase the full version of the program, and it will wipe out all the infections. Please have in mind that you need to keep the scanner constantly updated as this will allow it to detect all the latest threats. Simultaneously tap the Windows key + I.
Click on Control Panel, go to Uninstall a program and remove Saleslider. Access Add or Remove Programs and eliminate Saleslider. Launch the Start menu and go to Control Panel. Open Uninstall a program and delete Saleslider. Click the Open menu icon in the upper right corner of your browser. Go to Add-ons and then to Extensions. Simultaneously press Alt + T.
Go to Toolbars and Extensions. Simultaneously tap Alt + F and select More tools. Click the trash bin icon near the unwanted extension and then click Remove. Saleslider is an adware application that should not be tolerated in any case. It should offer you coupons with promotional codes on online shopping websites, but it attacks you with various forms of annoying ads. Moreover, the application spies on you, gathers information on your Web browsing, and even shares it with unreliable third parties. Remove the program by following the instructions you will find below. Tags: delete Saleslider, remove Saleslider, Saleslider.